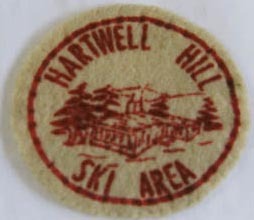 Hartwell Hill, located in Littleton, Massachusetts, was another one of those family operated ski areas that unfortunately did not survive into todays high paced society. This area, located just off the Littleton exit on Rte 495 on Hartwell Road, had about 4 rope tows and a vertical drop of just over 120 feet. 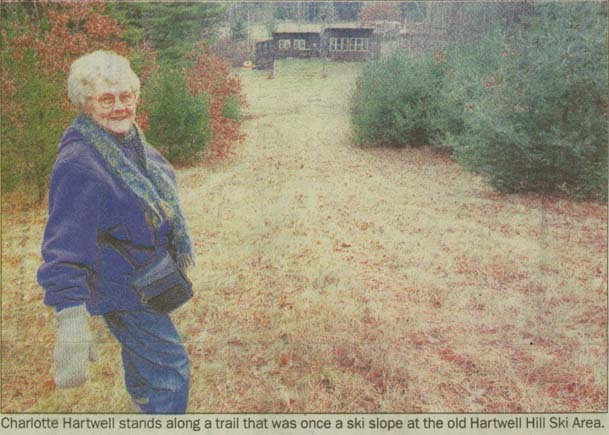 Charlotte Hartwell ran the area with her late husband Pappy in the 1960's and early into the 1970's. "Parents would leave their kids off at 8 and pick them up at 4:30 at night, bring their own lunches. We'd look out for them," said Charlotte Hartwelll, in an article from the Lowell Sun written by Peter Ward on Dec. 11, 1996. The area is still visible on Hartwell road...just look at the odd looking hill just off the road on the left as you drive down Hartwell Road. Here are several pictures of the area. Information and pictures for the first two from that Lowell Sun article by Peter Ward. Here's Charlotte standing next to one of the old slopes, looking down to the old base lodge. 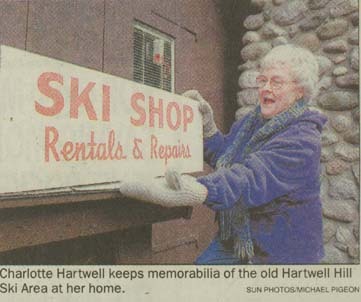 Here's a picture of Charlotte Hartwell and one of the old Ski Shop signs. 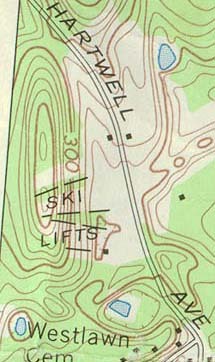 Here's the topographic map from the USGS taken in 1965. You can see the size of the area. Here's an annotated Terraserver pic of the area. Notice, while not large, the area was big enough for kids and learning skiers. 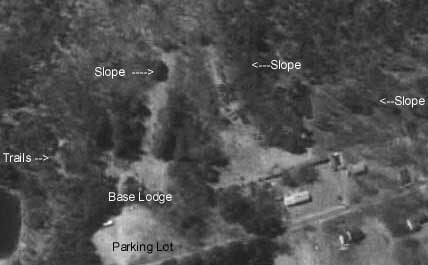 Also notice that the slopes are still clear, after 20-30 years of being closed. Here's a patch of the area, provided by Jim Clarke. 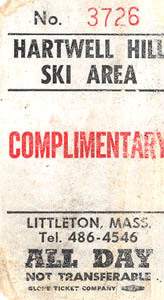 Joshua Segal sent us this great complimentary ticket for the area!